MyReporter.com Where is Michael Jordan’s childhood home in New Hanover County? Where is Michael Jordan’s childhood home in New Hanover County? How can I find pictures of the 1958-'59-'60 marching band of Brunswick County Training School? It is the second house on the left if you take College Road and head toward Interstate 40. You take the Gordon Road exit and take a right onto Gordon. I understand it does not look the same as when MJ was growing up. A tree obstructs the view of the house from the road. Jordan moved into that home when he was five years old after his family relocated from New York. It used to have a basketball court in the driveway, where Jordan often played his brother Larry in friendly, yet fiercely one-and-one games. Jordan lived in that home through middle school and three seasons at Laney. It also is the home where he held a press conference to announce he was signing with the University of North Carolina Tar Heels the summer before his senior season with the Buccaneers. Obviously the home now has new owners. Will, we’re checking with Chuck right now and will post a reply — and edit the post as necessary — as soon as we hear back from him. Thanks for speaking up! Will, you’re right. The information I got was incorrect. Tax records do show the address as 4647 Gordon Road. THE JORDAN FAMILY LIVED IN WALLACE FOR A WHILE BEFORE THEY MOVED TO WILMINGTON NOT NEW YORK. Michael, and his family lived in the city limits of teachey, Nc. To the west of Wallace on Calico Bay Rd. The house he, and his family lived in still stands, and also his grandparents house stands also. The house mentioned is the second house that Michael Jorean lived in on Gordon Road. The first house is further up on the left. I don’t know the address. When you search the address 4647 Gordon Road, Wilmington, NC at google maps/street view you can see a house that looks very familiar to the facade of the house in the video. It’s not the best picture by google and the tree in front is blocking, but my eyes says that it’s the house from the michael jordan videos. Picture 02 in the gallery is a screen capture from google. I’ve also posted a picture from the basketball backyard behind the house, where Michael and the brothers played ball. And a picture of the High Shcool he attended. 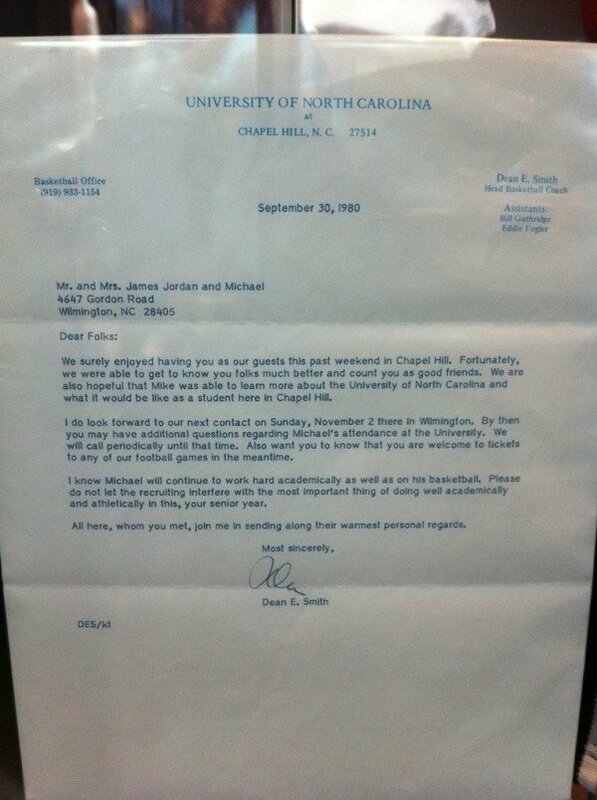 In a picture that was released of Jordan’s letter of intent it lists his address as 4647 Gordon Rd. This is in Sept. 1980. Can I just say what a relief to find someone who actually knows what theyre talking about on the internet. You really know how to bring an problem to light and make it important. Far more folks need to read this and understand this side with the story. I cant believe youre not a lot more well-known simply because you actually have the gift. At some point, he also attended New Hanover High School and DC Virgo middle school and lived across the street and down a few houses from us on Princess Place Drive. Perhaps they rented? This was around 1988 I believe give or take 2 years.